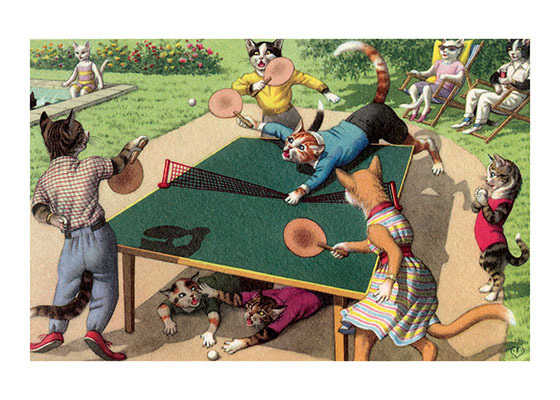 These Cat couples are having an athletic game of ping pong, while their offspring watch and squabble. Eugen Hartung (or Hurtong) (1897-1973) was born in Switzerland. 'In addition to the Mainzer images he apparently illustrated fairy tale and other children's books, notably the childrens song book Come, Children, Let's Sing published to promote the Maggi Soup company. He also created several murals in public buildings in Zurich.